When a business-owned car or truck is involved in an auto accident, the vehicle or other damaged property may leak noxious substances. These materials can injure third parties, contaminate their property, or pollute nearby land or water. The injured parties may file auto liability claims against the business. The standard ISO business auto policy (BAP) contains a broad pollution exclusion that eliminates coverage for most pollution-related claims. Fortunately, the exclusion contains exceptions that give back coverage for certain types of incidents. The pollution exclusion contains two important exceptions. Both cover bodily injury or property damage arising from pollutants themselves as well as the cost of cleanup. In the business auto policy, cleanup costs are referred to as covered pollution cost or expense. This term (which is defined in the policy) includes the cost of testing, monitoring, cleanup, and other activities you are required to perform by law or because of a government claim or lawsuit. Cleanup costs are covered only if they are incurred as a result of an accident that also causes bodily injury or property damage covered by the policy. Your insurer will not pay cleanup costs you incur in the absence of covered bodily injury or property damage. 1. Fuels, Lubricants, Exhaust Gases etc. The pollutants are released from the part of the auto designed to hold or store them. For example, gasoline is released from the vehicle's gas tank, not from a gallon jug of gasoline stored in the trunk. The damaged vehicle qualifies as an auto (it is not mobile equipment). Suppose that a covered auto is involved in an accident and engine coolant leaks from the radiator. Engine coolant is required for a vehicle to operate normally. Coolant is typically stored in the radiator. If an insured business is sued for bodily injury or property damage caused by the spilled coolant, the claim should be covered. Likewise, brake fluid is needed to enable the braking system to function properly. If a covered auto is damaged in an accident and brake fluid leaks from the brake fluid reservoir (its usual storage place), the insured business should be covered for claims arising out of third-party bodily injury or property damage caused by the brake fluid. Here is an incident that would likely fall within the "fuels and lubricants" exception. Premier Plumbing owns three trucks that company employees use to travel to job sites. The trucks are insured under a commercial auto policy that has a $1,000,000 per accident limit. Premier Plumbing has been hired by the Heavenly Hotel to upgrade some bathroom piping. Paul, a Premier employee, is entering the hotel parking lot in a company truck when the vehicle hydroplanes on wet pavement. The truck crashes into a stone sculpture on the hotel lawn and rolls into a nearby lily pond. The truck's gas tank is punctured by the impact and gasoline seeps into the pond. The Heavenly Hotel files a property damage claim against Premier Plumbing. The hotel demands the Premier pay the cost of replacing the statue ($5,000) and cleaning up the pond ($10,000). Premier submits a liability claim to its auto insurer, which agrees to pay the hotel $15,000. The damage to the statue is covered because it was caused by an accident that resulted from the use of a covered auto. The cleanup costs are covered because the pollutants were released as a result of an accident that also caused covered property damage. The second exception applies to pollutants released due to the upset, overturn or damage to their container (or to the pollutants themselves) as the result of an auto accident. The accident must occur away from your premises and involve a covered auto. In addition, the pollutants cannot be located in or on the covered auto. Here is an example of a loss that would likely be covered by this exception. Pamela is an employee of Premier Plumbing. She and two other employees are heading to a job site in a large company truck. Pamela is driving on a rural road and approaches a railroad crossing. The warning bells begin to sound and the lights start to flash. Pamela ignores the warnings and attempts to clear the tracks before the train arrives. Meanwhile, a freight train carrying a tank of sodium hydroxide is approaching the crossing. The locomotive operator applies the brakes but is unable to avoid hitting the back end of the truck. No one is hurt but the tank car derails, spilling 2,000 gallons of sodium hydroxide. Because sodium hydroxide is caustic, the railroad immediately reports the spill to the state environmental authority. 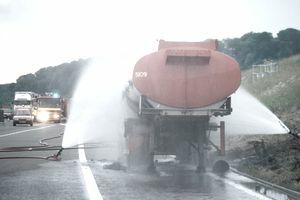 The state summons a hazardous materials cleanup crew to mop up the mess. Several months later, Premier Plumbing receives two demands. One is from the railroad, which seeks $50,000 to repair the damaged tanker car. The second demand is from the state environmental authority, which orders Premier to pay $500,000, the cost of cleaning up the sodium hydroxide. Pamela's accident took place away from premises owned by Premier Plumbing. The accident occurred while Pamela was driving an auto covered under the plumbing company's auto policy. The pollutants (sodium hydroxide) were not in or on a covered auto and were released as a result of an accident that caused property damage covered by the policy. Thus, Premier's insurer should pay both the $50,000 to repair the tanker car and the $500,000 in cleanup costs.